The good people at Made Like A Tree kindly invited us to put together the 50th edition of their podcast series, an offer we very happily accepted. MLAT have had a wide selection of worthwhile and interesting mixes, and it was a pleasure having the opportunity to contribute. PC continued in a similar vein to the recent mixtapes that have been featured here, compiling a diverse and thoroughly enjoyable selection. For my mix, I constructed a 2 hour headphone mix, which for a lack of a better word could be described as 'ambient', even though I don't think this accurately conveys the mood of most of the music. Anyway, listen and you'll find out. MLAT also did an interview with both of us, something they probably ended up regretting, given the long answers PC and myself gave... If you are interested, you can check the interview and the mixes here. Next week they'll post the tracklists, and potentially a second part to the interview. Big thanks to MLAT! nice interview, a bit rough on some questions :) still have to listen to the podcast.. Looking forward to pt2 and checking the mixes. I think PC's last mix has been the most played item on my iTunes this year and that doesn't include repeated listens on the car radio...! It's been a fun few years reading, I hope it doesn't end anytime soon. Ps. 58 days and counting. This has been an exhausting year....I need that dancefloor. @ Rokas: yes, definitely a bit rough on some questions. I think the universal caveat for everyrthing I write on ssgs should be: PC drinks very strong coffee, and can touch type. yes,more like a forum, you say you started ssgs because you wanted to share stuff, i wish people would be involved more into this sharing, ofcourse its all up to you and that would need more work on the blog, but it would become a place for people to get invoved and imo much bigger thing than ssgs is now.. Most odd, I haven't listened to "lady cab driver" for god knows how many years. That was until last week, when it became one if those songs that randomly pops into your head, desperate to be listened to. Needless to say I was most pleasantly surprised to hear it open PC's mix. @ Rokas: hmm, I think I get your drift, but... in my experience it takes a lot more effort to sustain things than conceive of them. Would it work, in the long term? I guess: ssgs is never gonna be everything everybody wants it to be all the time. I'm fairly happy with what it is, and think that there's a nice limit to what's possible for two people and the clunky blogger interface. It is what it is. i agree it takes a lot of work and im not saying that something youre doing is wrong, what im saying is that what im lacking here is such discussions like this..
but one thing that really needs to be understood is that what we are doing now in terms of the blog (and various other things we are involved with behind the scenes) is basically the maximum in terms of time we can commit. so this limits our ability to try new things, at least for the time being. 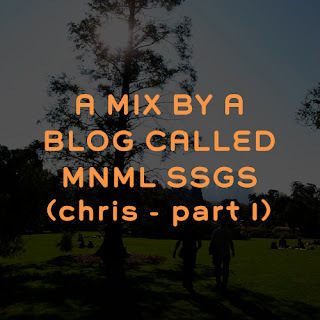 I'm a bit late to this post, but - picking up on what Rokas says (Im not sure if we’re exactly on the same page Rokas, so forgive me if I’m misreading you), I kinda agree that I'd like to see mnml ssgs spread its wings a bit. I appreciate that day jobs i.e. time, is a factor, but it would be nice to see this whole "thing" evolve from where it is now. I'm not sure what form that might take, but I feel there is room to give it some legs. One thing that strikes me reading the linked interview, is that techno does not seem like something either of you listen to independent of all other culture. Techno may not necessarily be the lens through which you view the world, but is at least the round table at which you discuss it (Ha!). So, I'm not saying mnml ssgs should become residentadvisor (which I like a lot actually, despite the fact that it has a lot of content I have no interest in), but I'd love to see a bit more flesh on its bones. Maybe interviews with writers/artists as well as musicians? Guest posts? A forum? Some kind of video component? I dunno, easy to propose in a single post, more difficult to realize, but something I think might have an appreciative audience. Swell interview and really interesting take on the music industry. You guys are some of most forward-thinking people writing, sharing, and most importantly listening. 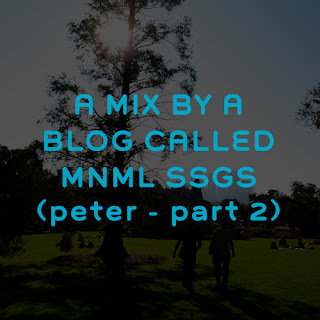 I disagree with making mnml ssgs more open for discussion - the comments area has some quality discussion and the posts are really thoughtful, showing how you are progressing as listeners and sharers. The event you're doing Today's Art Festival seems to be a superb extension of mnml ssgs in an expansive way. Plus, hearing about the other events you do, even though I cannot attend them, is refreshing and provokative - even from a distance. I actually find it refreshing that you are ordinary people, working while making time to put energies into projects you truly care for and are passionate about. It really shows. Working with the limitations, making the best possible thing with those time constraints and other constraints is boss.